Hardy (When Brothers Meet, 2017, etc.) tells the story of a small, baseball-loving town in Pennsylvania as it prepares for the annual league championship game–but the rivalry between two teams goes much deeper than friendly competition. Alex Sardinski, the chief loan officer at the only bank in Pineville, loves two things: baseball and his fiancée, Candy Hollis, a teller where he works. As he prepares for another shot at the championship and a future with Candy, his life seems perfect. Little does he know that farm-equipment business owner Conrad Beamis has a vendetta against him for not approving a business loan two years earlier. Step by step, Conrad sets out to exact his revenge on Alex by taking away what he loves most: first, his relationship with Candy and then the baseball championship. The couple starts having difficulties after Conrad hires Candy as his personal assistant, and a championship for Alex’s Cherokees feels impossible– the business tycoon stacks the Creeks team, and even the umpires work for him. Then a strange boy named Timmy joins the Cherokees for their final game against the Creeks. The baseball diamond becomes a place of transformation, justice, and the supernatural in a comedic romp of a finale. If this book’s antagonist sounds a bit overly diabolical for the context, that’s because he is; indeed, the devilish Conrad comes off as something of a mustache-twirling villain. In contrast, the main character, Alex, is likable though a little bland–somewhat like the story’s small-town setting. Those looking for a simple, somewhat predictable story of an underdog team will enjoy the outcome, however. There are some touching moments, as when Conrad’s autistic son, Ray, gets his first-ever baseball hit. A lot of paranormal occurrences during the game simultaneously amuse the crowd and teach lessons about cheating, fair play, and overall goodness. A nostalgic, heartwarming look at small-town baseball, but its scheming villain can make it difficult to take seriously at times. A great read!! If a baseball team ever needed help, it is today; yet somehow Alex Sardinski suspects that a savior is out there, as the Cherokees, the youth baseball team he coaches, battles it out with their biggest rivals, the Creeks. Sardinski, a banker in the tiny town of Pineville, PA, has coached the Cherokees for fourteen years. His passion for the sport, his willingness to play fair, his openness to take both boys and girls for the team, are all part of who he is. Another important piece of Sardinski’s character of late has been his loving feelings for Candy Hollis, who works in the bank. Alex has even found a nice little house for sale that they can just afford. It all seems like a dream coming true. But there is a force of evil in Pineville – Conrad Beamis, who owns the only big business in town, a textile mill, and supports the Creeks. Beamis is enraged at Sardinski for refusing to recommend him for a loan, and schemes revenge. He recruits big, rough boys, secretly too old for the team, and has the umpires in his pocket, folks who won’t defy Beamis for fear of losing their jobs. But worse, he courts Candy, offering her a big salary to be his personal secretary. By the day of the championship game, Beamis is crowing and Sardinski is sweating. But Sardinski has a secret weapon, a small, energetic kid named Timmy, newly recruited as a pitcher. Timmy and his mother Maria seem to have come from out of nowhere, yet know all about the love lorn banker even without being told. As the big game looks lost, 6-0 in favor of the Creeks, Timmy starts displaying his remarkable, almost supernatural skills, and things slowly turn around. Author, businessman and former Marine Hardy (Whisper in My Ear, The Place Where the Giant Fell, When Brothers Meet) has created a magical mystery combining the excitement of a kid’s baseball championship with the course of a true love derailed and a serious adult rivalry that threatens an entire community. His writing shows an enjoyment of simple, hometown humor and empathy for young people and their activities. But there is something else, an unusual element crucial to the story: embedded in this small-town sports saga is a spiritual parable. Hardy skillfully insinuates the religious aspect revealed in the book’s title into a fast-paced, amusing, romantic story that has the power to charm readers of all ages. Quill says: Hardy’s page-turner plot could make an excellent focus for family religious study, and will appeal to baseball fans for the many small touches that indicate an insider’s expertise about the game. This book had me laughing. A nine year old boy is God’s instrument in teaching a rude and no good business owner that cheating will have it’s consequences in a ballgame you’ll never forget. Conrad, the business owner treats his employees like crap and uses them to cheat and make bad calls when Timmy, the opposing pitcher gives them an afternoon of their own medicine that will have you laughing and wanting more. Another great book from John Henry Hardy! He keeps you intrigued and laughing throughout the entire game. Awesome book! Really great baseball story I was able to read with my son. We both love baseball and this was a great tale with some interesting tangents to make you thank about life. Great read! FQ: What is your baseball background? HARDY: Well Barbara Scott you may chuckle over this, but my baseball experience is limited to playing in the cow pastures with my cousins who lived next door to me in an old duplex farmhouse. I also played grammar school baseball with the orphans who resided at Saint Michael’s Children’s Home in the little town of Hopewell, New Jersey. That being said however, my daughters Michele and Wendy were rather athletic and were the only two girls to make a league team. The boys all wore their hair long as was the style then so the coach thought they were boys, since he didn’t know any of the kids’ names as it was a try-out session. When practice was over and my two kids were picked to play on the team, the coach was flabbergasted when I called them by name. It was a miracle they made the team. That is the basis for concocting the story The Day God Played Baseball. I also did a lot of research to learn about various pitches and the rules of the game, and that league coach, whose real name I can’t remember, became Alex Sardinski, one of the main characters in the story. FQ: Do you come from a tiny town like Pineville, PA? HARDY: Yes I owned a small farm in Pineville, Pennsylvania for several years. We had five cows, two horses, hundreds of chickens, several dogs and a couple of rabbits. My children learned responsibility early in life, since taking cre of farm animals is a lot of work; it was how I grew up. We actually lived in Pineville, when the girls made the league team. The town is so small it looks like a mere cross-roads to a stranger. It had a general store that also served as the post office and boasted of a tavern, both of which are depicted in the story. FQ: You seem to know a lot about the textile industry; where does that knowledge come from? HARDY: I worked on a farm that belonged to Catholic Charities and its produce went to the orphanage mentioned above, Barbara. We would take the corn and other grains to the feed mill and have it ground up into feed for the stock. That is when I learned about the colorful flour sacks the farmer’s wives made into dresses, skirts and blouses. Of course there was the ubiquitous burlap bags for the cattle feed, but later the plastic coated feed bags became very popular and were cheaper to make than the cloth bags. I also researched the textile industry to make certain I knew something about that industry. FQ: Do you envision this book as suitable for young adult readers? HARDY: I was raised in a Catholic home and I have a strong belief in God, and I wanted to write something that the youth of this country might find interesting and perhaps inspirational. Our country was founded on Christian-Judeo principles that are waning as progressives and the American Civil Liberties Union push our nation toward atheism, with the assistance of the liberal ideologists in our schools and colleges. FQ: You have several “miraculous” happenings in the baseball game engineered by Timmy; how did you decide what specific plays/moves God might make? HARDY: Actually Barbara the ideas just popped into my psyche as I wrote the book. I wanted something simple and subtle, and not out right miracles. I wanted the story to be humorous and not to religious oriented. I also wanted a story and the character of Timmy to relate to all religions and not just Christianity. FQ: Maria is a “natural” name for the mother of God, but why did you choose Timmy (later Tommy) for the “god-boy” baseball ace? HARDY: Well Barbara, I wanted the God character to have a name just like any other kid who plays baseball. The name Maria points you in the direction of who Timmy really is in the story, but his common name identifies more closely with the kids who actually play baseball. When it become so obvious that God loves baseball as much as the other kids do when He appears as a pitcher for another team and another season, I wanted a name that was very similar to Timmy’s name so a youngster could readily identify the new pitcher on Alex’s team; a one letter change from Timmy to Tommy worked very nicely for me. FQ: Have you known of amazing turnarounds in a life such as you depict in the life of Conrad Beamis? HARDY: I once worked in the business world and met a few people who remind me of a Conrad Beamis type character, although all of them were not males; I wanted to make fun of them as they did some rather mean things. My wife was a Chemical Dependency Nurse and detoxed many drug and alcohol abusers-the Heroin users were the worst patients-and although I never knew their names I knew their turn-around stories. FQ: One scene that is especially moving is when Conrad’s autistic son makes a great play. Have you worked with autistic children in sports? HARDY: No I have not, but I have a relative who is autistic, and I can tell you first hand that they live a rather challenging life, and I wanted to give a young adult who reads this book a glimpse of what kinds of challenges autistic children-and their parents-face every single day of their lives. When that autistic boy finally gets a hit and the people cheered, I hope it gives the reader the impression that all is not lost for for these unfortunate people if we love them and support their efforts. FQ: What can you say about baseball as a character-building sport for children? HARDY: Baseball, and in fact all sports are a great opportunity to instill in all children a sense of work, comradeship, and self confidence. Hopefuilly, they will relize the need to be physically active all of of their lives. The lack of exercise is one of the major causes of poor health among adults, along with smoking and drug abuse, which includes alcohol. 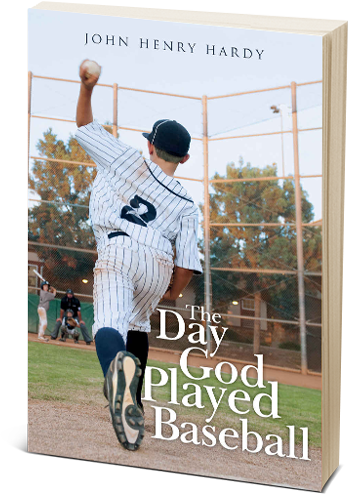 FQ: Do you envision a sequel to The Day God Played Baseball? HARDY: Maybe some day the good Lord will inspire me to write something like The Day God Played Baseball, and hopefully if I work hard enough at it the kids will understand and espouse that we need to keep God in our Pledge of Alligence and in the Christian-Judeo principles upon which our country is founded!